MALABO, Equatorial Guinea, Dic 03 (IPS) - The Confederation of African Football (CAF) has joined a number of football stars, celebrities, international health organisations and corporations in the ‘Africa United' global health communications campaign aimed at preventing the spread of Ebola in West Africa. The campaign, which was launched on Dec. 3, is supported by the U.S. Centers for Disease Control and Prevention (CDC) Foundation and driven creatively by actor Idris Elba, is designed to recognise the vital role of front-line healthcare workers, as well as to provide critical education and resources for the people of West Africa. In "West Africa vs Ebola", a video which has been prepared for the campaign, Elba stars as a soccer coach giving a rousing and educational team talk to a West Africa team in preparation for its "life or death" game against Ebola. Elba explains the symptoms of Ebola and tactics for how to beat the virus, which includes spreading the word and working as a team. "I wanted to support this campaign for so many reasons. I could not sit back without doing something to help fight Ebola," said Yaya Touré, Ivorian professional football (soccer) player. "It is important we don't treat this as something we just discuss with work colleagues or simply follow on the news for updates – instead our focus should be to do something." "I also wanted to get involved with this campaign as it pays tribute to the many, many African heroes who are in the villages, towns and cities using their skills, resourcefulness and intelligence to battle Ebola. Those people on the front line are often forgotten. African mothers, fathers, brothers and sisters are doing everything they can to fight Ebola - we have to support them." 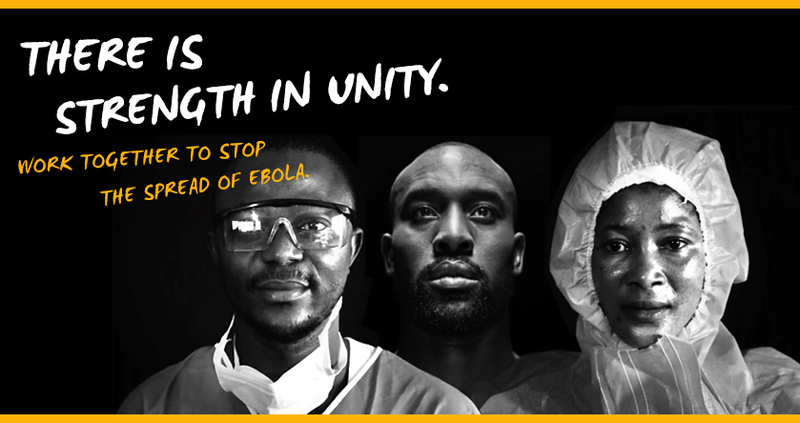 In a TV spot titled "We've Got Your Back", Elba and a group of football players committed to the fight against Ebola in West Africa, including Yaya Touré, Carlton Cole, Kei Kamara, Patrick Vieira, Fabrice Muamba and Andros Townsend, voice their solidarity with the healthcare workers who are risking their lives every day to fight Ebola. In the video, the players acknowledge that, although fans regard them as heroes, healthcare workers tackling Ebola are the true heroes. Each player wears the name of a healthcare worker on his back as a symbol of respect for "the world's most important team." "For me the battle against Ebola is a personal one," said Elba, actor and the creative force behind the development of the campaign public service announcements. "To see those amazing countries in West Africa where my father grew up and my parents married being ravaged by this disease is painful and horrific." "Imagine having to sit down and tell your family that you were going to fight this disease. That conversation is happening across West Africa and around the world every day. I am in awe of the bravery of these health workers, who put their lives at risk day in and out to stop the spread of this terrible disease." "My hope," Elba added, "is that, in some small way, through the development of these public service announcements and the creation of the Africa United campaign, we can ensure that these workers get the support they need and that health messages are delivered to people on the ground to help them in their fight." The video spots and other multimedia educational materials are being made available on the campaign website in English, French, Krio and additional local languages. The educational materials are designed to be adapted and distributed by Africa United partners such as ministries of health, health clinics, government and non-governmental organisations, media and sports organisations. These include the CDC Foundation and current partners Africa 24, SuperSport, ONE, UNICEF and Voice of America. CDC staff working in the affected countries contributed to the development and distribution of the health messages, and Africa United will continue to develop and provide messages to CDC and partners in real time based on changing needs. The 2014 Ebola epidemic is the largest in history, infecting nearly 16,000 people with more than 5,600 deaths to date. While the spread of Ebola is a threat to people, health systems and economies around the globe, West African communities in particular are being crippled by the disease as a result of already-strained healthcare systems, mistrust of healthcare workers and fear and stigmatisation of those infected. "Private and public partnerships like Africa United are critical to aligning organisations fighting Ebola and to ensuring quick, effective responses to changing circumstances and needs," said Charles Stokes, president and CEO of the CDC Foundation. "The CDC Foundation remains committed to advancing response efforts in West Africa through public education and resources for use on the front lines of the Ebola battle."